based solutions for roofs, land and water. Products include plants, seeds and pre-fabricated vegetation mats. 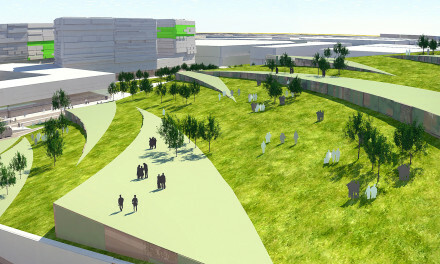 The company calls its offerings “Green Roofs”, “Green Gardens” and “Green Façades”. In operation since 1988, Veg Tech was created by the merger of Svenska Lövträd and Nordiska Gröntak. With headquarters in Fagerås in the south of Sweden, Veg Tech has production facilities in five locations around the country. Number of employees: 28. Earnings of SEK 16 million on revenues of SEK 67 million. Have you ever had to remove moss and other vegetation growing on your roof? Veg Tech, based in the south of Sweden, has built a thriving business around turning that problem into an opportunity. Veg Tech’s “Green Roof” puts carpets of living vegetation on roofs and other flat surfaces. It’s not the old-style sod roof of grass or peat, but a specialised vegetation system. And it can help improve the urban environment at the same time it cuts energy costs for building owners. The future may see a big increase in green roofs — and even walls — in urban areas. 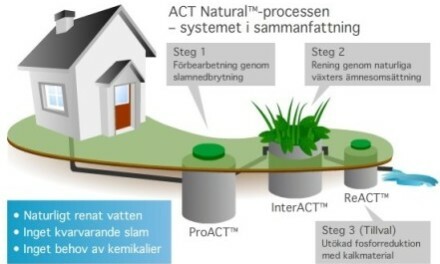 Only a modest amount of roof surface area has yet been fitted in Sweden, but the municipality of Malmö, the third-largest city in the country, has made consideration of green roofs part of the permitting process. And German authorities have enacted green space requirements for new construction. With interest growing throughout the Nordic area, Veg Tech is finding customers among builders of schools, industrial buildings, offices, stores, libraries, apartment blocks and single-family homes. Research in Germany has shown that investment in a green roof can be offset within a few years by reduced energy costs. And a future-oriented study from Chicago estimated that roof vegetation on all the city’s buildings could save about $120 million each year in energy costs. It turns out that green roofs work all year round, reducing heat gain during summer months and providing insulation to keep heat in during the winter. The insulating effect regulates temperatures throughout the day and night as well. The effectiveness of roof vegetation in insulating a building will of course depend on construction thickness and the type of vegetation used. But even a thin and light layer — as little as 5 cm — has been shown to provide effective insulation while also protecting the underlying construction materials from ultraviolet light and temperature swings that can reduce lifespan. Rooftop vegetation can help reduce noise levels, especially in urban environments with multiple noise sources and many hard, sound-reflecting surfaces. The thicker the vegetation layer, the greater the dampening effect. A study conducted at Malmö University showed that rooftop vegetation resulted in a noise reduction in the underlying premises of 6 dBA compared to a standard roof. A roof is a somewhat extreme environment. Various combinations of heat, cold, wind and precipitation make life difficult for many plants, requiring combinations of plant species that can thrive in difficult conditions. Mixtures of peat and sedum, or of sedum, herbs and grass work well. Sedum is a plant genus which includes a variety of species. In nature, these plants are found in open, dry and stony soils. Drought and the challenging environment of a roof replicates the natural conditions in which sedum grows well. Mosses are also well suited to live on exposed roofs with minimal soil and little water. They recover easily after periods of drought, and spread during cold seasons. These characteristics make moss an excellent complement to sedum in the construction of a green roof. A living roof can provide exciting experiences for homeowners. The appearance of moss-sedum vegetation varies depending on the season, and by the amount of exposure to sunlight and moisture. 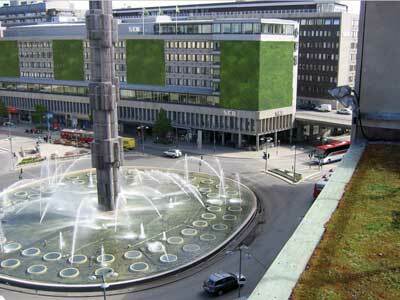 Green roofs cut energy costs, filter airborne particulates and increase humidity. Capture of harmful particles. Urban planners have long recognised that green areas reduce dust. Plants are excellent particle filters. Improved rainwater run-off from the roofs. The vegetation layer reduces run-off and evens the flow, an important consideration in areas where most surfaces are hard and non-absorbent. Improved urban climate. Rooftop vegetation contributes to increased humidity and lower temperatures in dry, warm urban environments. Integration of buildings in the surrounding environment. The term “green area factor” is a measure of how well buildings blend into the environment. At Västra Hamnen in Malmö, the roofs on a number of properties include vegetation layers; the total area amounts to more than 10,000 sq m.
Reduced climate impact. Plants on roofs bind carbon dioxide; it is estimated that 10 sq m area of drought-tolerant vegetation takes up as much carbon dioxide as a tree. Does rooftop vegetation cause problems? There are legitimate questions about potential drawbacks of rooftop vegetation. Does it weigh too much? Can it lead to excess water retention or insect infestation? Does it need to be cut like a lawn? Is there a fire hazard? According to Veg Tech, rooftop vegetation is relatively light, weighing about 50 kg/sq m when the plant/soil layer is held together with a frame of light reinforcing structure that does not break down or shrink. The company selects plants with thin, weak roots that will not damage the underlying layer. The resulting ecosystem is generally dry enough to fend off other plants with stronger roots. Insects and animals have not created problems. Fire safety authorities have approved rooftop vegetation composed of moss-sedum, because the amount of organic material is low and the vegetation holds water. In addition, the layer of soil and vegetation is separated from the waterproof roof seal by a draining layer. 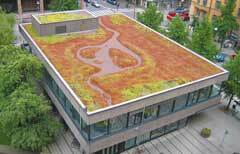 Green roofs require minimal maintenance in the form of fertilisation, at most once each year. Sedum and moss can survive long dry periods even if they may appear less vibrant. There’s never any need to haul a lawnmower up to the roof.